Stenciling is so much fun and a great way to create unique artwork. 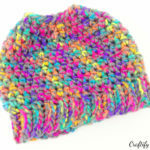 Either for yourself or as a wonderful handmade gift! 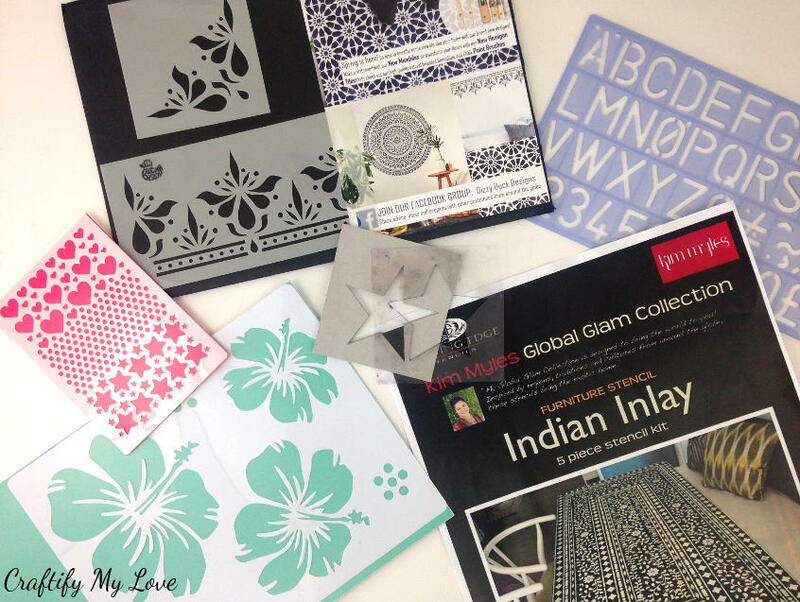 Read up about the must-have supplies for stenciling to rock your next creation! “But I’ve never stenciled before!” you say? Don’t fret, I’ve got you covered! 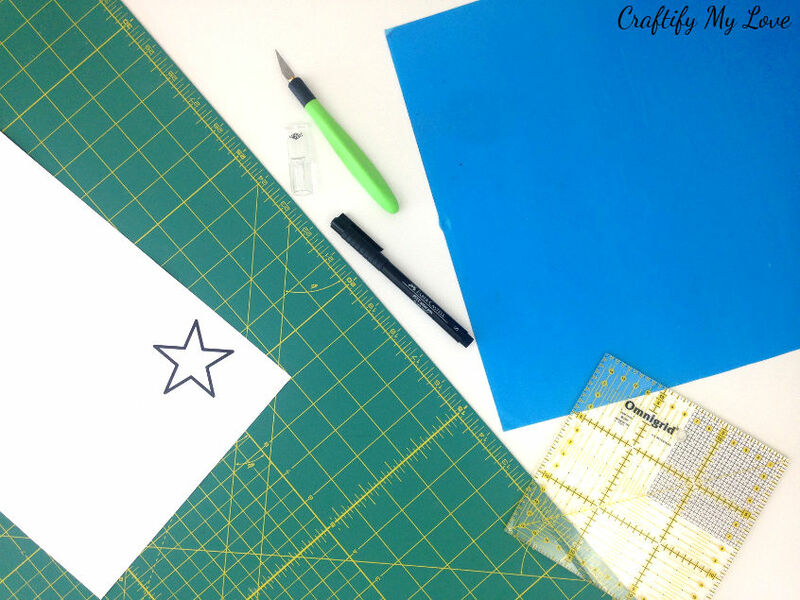 I’ve put together a super detailed guide with all the info you need to know about stenciling. I have stenciled quite a bit and learned a lot during my projects. Yes, stenciling can be tricky at times! 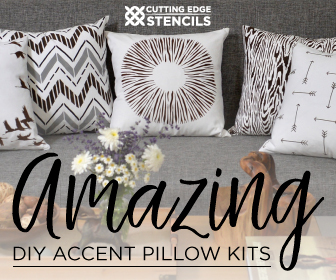 But, if you learn from my mistakes rather than making them yourself you’ll master the art of stenciling with your very first stenciling project! 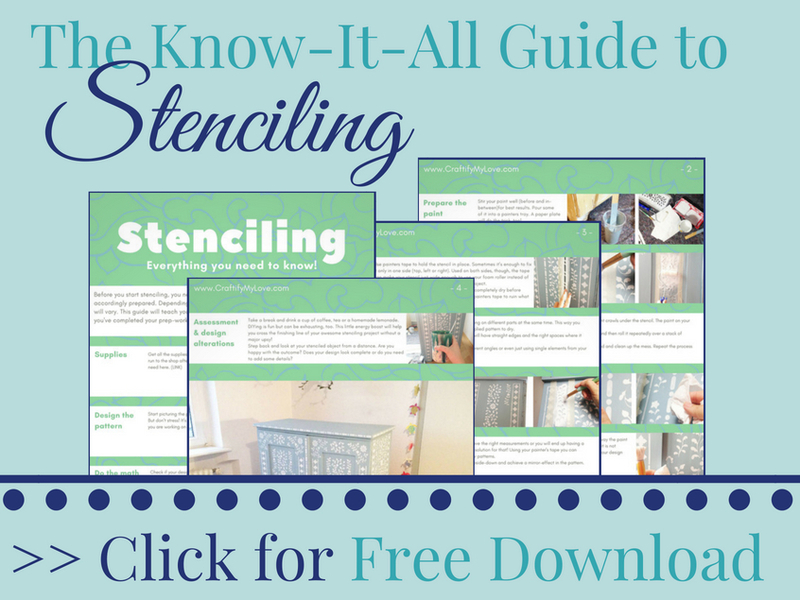 Download your FREE “All You Need To Know About Stenciling”-Guide now! or upcycle an old piece of furniture or a tray. You could even make a stunning vase or holder for kitchen utensils from an empty pickles jar. 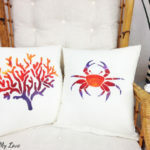 By stenciling fabric, you can create wonderful home accessories such as cushion covers (see this great idea over at favecrafts.com), area rugs, dish towels, or curtains. Or you could even design your own clothes! 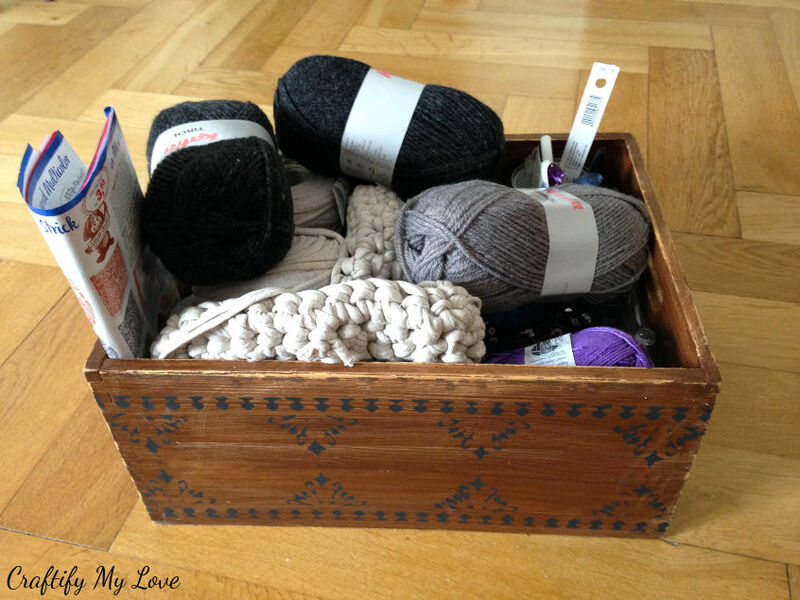 Investing in good supplies is definitely worth it as you will re-use them over and over again! 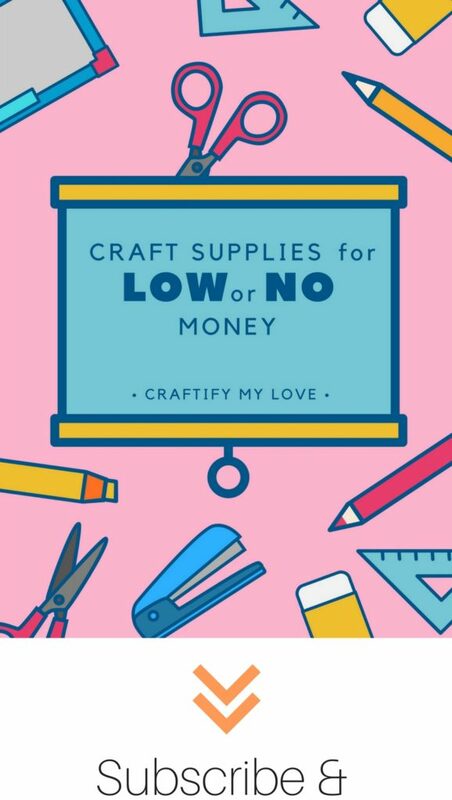 OMG, there are soooo many options out there, ready for you to fall in love with and buy (trust me when I say: even without a project in mind, lol). 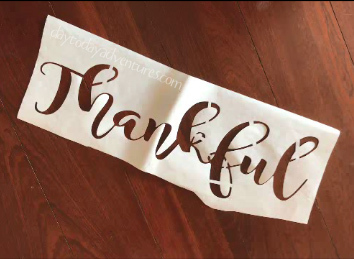 You can shop online for stencils for example on Amazon or Etsy or you go to your local craft store or Home Depot. I personally love the quality, designs, and patterns from Cutting Edge Stencils and Dizzy Duck DesignsUK. What’s your favorite stencil and where have you got it from? Admittedly, stencils can be a bit pricey at times. That’s why I always love to browse the SALE section of a shop first! Why not check now if Cutting Edge Stencils has a sale at the ready. 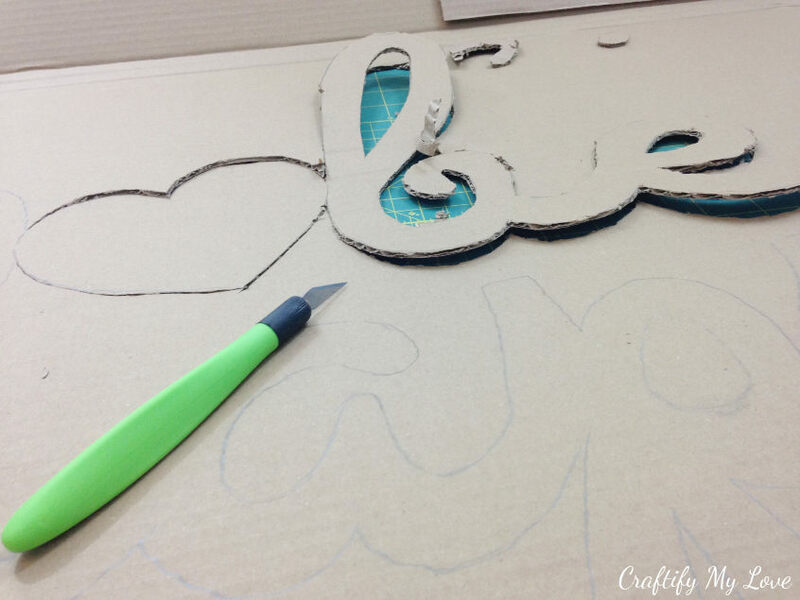 How To MAKE Your Own Stencils? Of course, you can create or DIY your own stencils, too! Either by hand or by using a vinyl cutting machine. by simply googling the design you have in mind. Many Bloggers offer them as a free download for your convenience. Or trace the design from something you love – e.g. I’ve photographed so many wonderful tile and Woodwork patterns when visiting my family in Morocco. Drawing something yourself is an option, too. Geometric designs are actually pretty simple to make. I am currently working on a short video that will explain the process for you in detail. Make sure to subscribe to my YouTube Channel so you’ll get notified once it’s published. The file type can vary depending on the vinyl cutter you use! 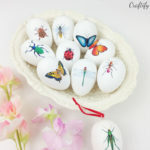 They can be found all over the internet for free or little money or you create a stencil design yourself! The cutting machines by Brother have this amazing scanning feature where you simply hand-draw your design. Scan it. Cut it. Done! 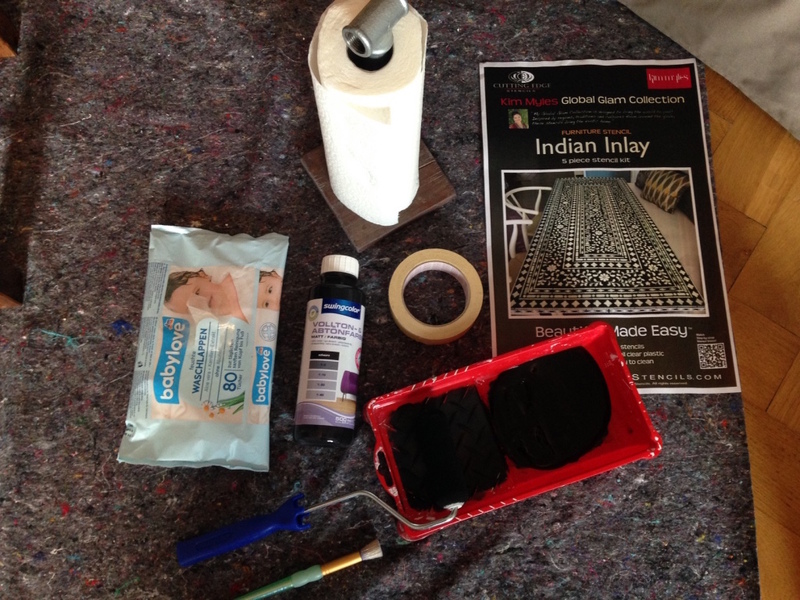 In this great tutorial by my friend Kim from Day To Day Adventures on how to personalize a coir rug, you’ll see how to make your own stencils using a Silhouette Cameo. In fact, she is using freezer paper as an alternative to the Vinyl. Have you ever thought about using unconventional materials as a stencil? Can you come up with even more ideas? Let me know in the comments. You have many options and can make your decision based on the nature of your project, the type of surface you are stenciling on, and even the stencil itself. I have worked with and achieved great results using stained varnish, acrylic craft paint, and even spray paint. Interior latex paint and fabric paint are other options. If you have a special color in mind, why not mix your paint yourself? 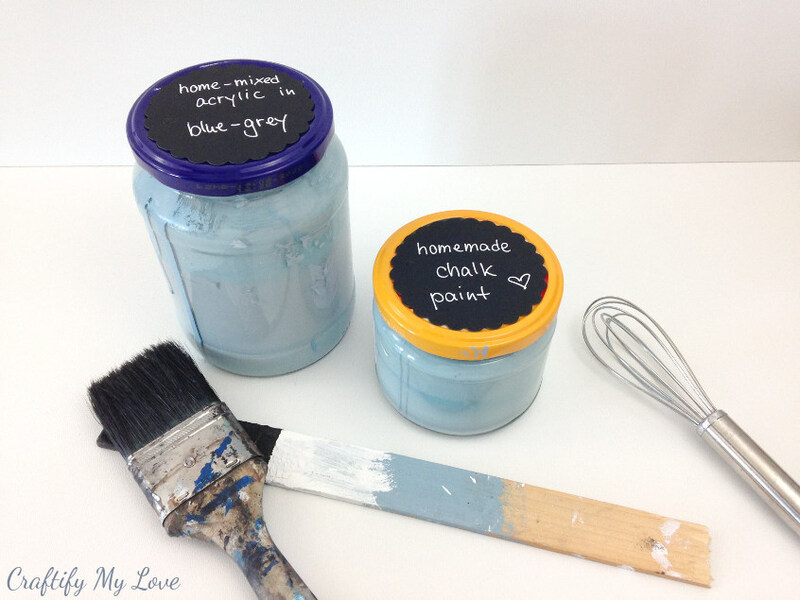 Here is my go-to recipe for homemade DIY chalk paint. The options aren’t that big here in Germany just yet, so I figured I try my hand at homemade chalk paint. And you know what? Full coverage with one coat!! Also, mixing up your own chalk paint is way cheaper than buying special brand ones. another one to apply a coat of wax to protect your piece of art (read up on how I clean & store the brush I use to apply furniture wax). Foam stencil brushes or pouncers can be a good alternative, too. Basically, you need to see what works best for you and your project at hand! And if you really need to do any touch-ups after the stenciling, a very thin liner brush is your go to choice. 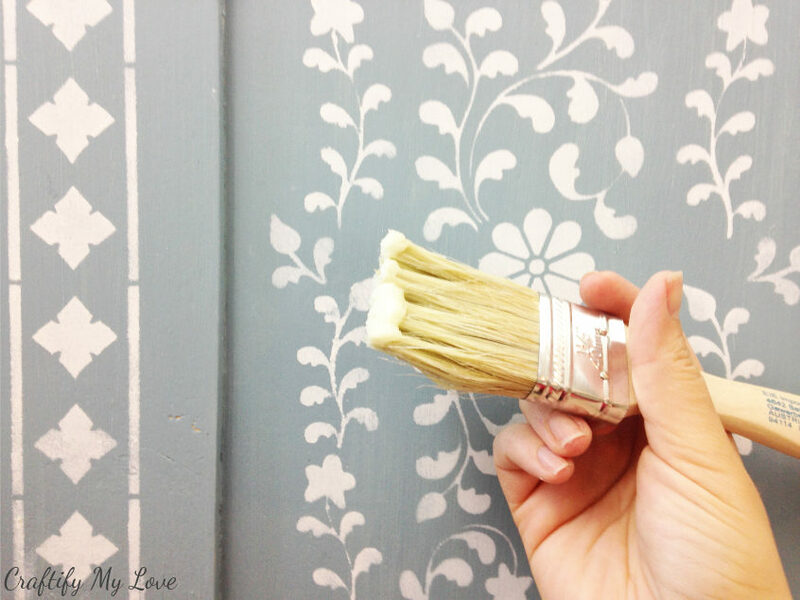 Say goodbye to perfectionism when DIY-ing! A dense foam roller is speeding up your stenciling process. A. Lot! If the surface you are working on allows it, I’d definitely go for a foam roller! Decide on the width you need (4″, 6″). 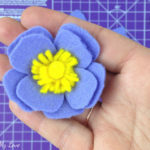 A mini foam roller can come in handy for delicate designs or multi-color projects. I would also suggest you use a separate roller for each color for faster stenciling. You don’t want to have to rinse paint and wait until it’s completely dry again, as residual water in your roller will create seepage under the stencil. You can reuse a painters tray a gazillion times. So it would definitely be the green option! But a paper plate will do the trick, too. I bought the stenciling essentials set by Cutting Edge Stencils and I love it. You can save a little if you buy the set rather than the items each on their own. My opinion? I don’t use the level super often, but it’s nice to have it at hand. You can easily slide it onto the stencil. Very nifty! Painters tape to fix your stencil to the surface you are working on. Sander & Sanding Paper to prepare your surface if it is wood. Furniture wax to protect your finished design. Cardboard, protective cover sheet, or something similar to protect your work space. You know what? 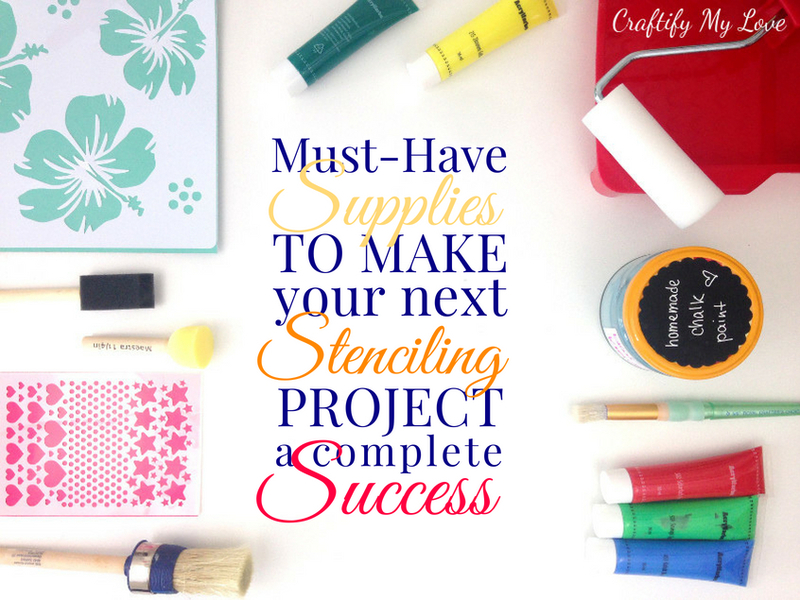 I bet you already might have some of those must-have supplies for stenciling in your crafting stash! 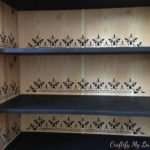 Shop what’s missing now to start your stenciling project right away. 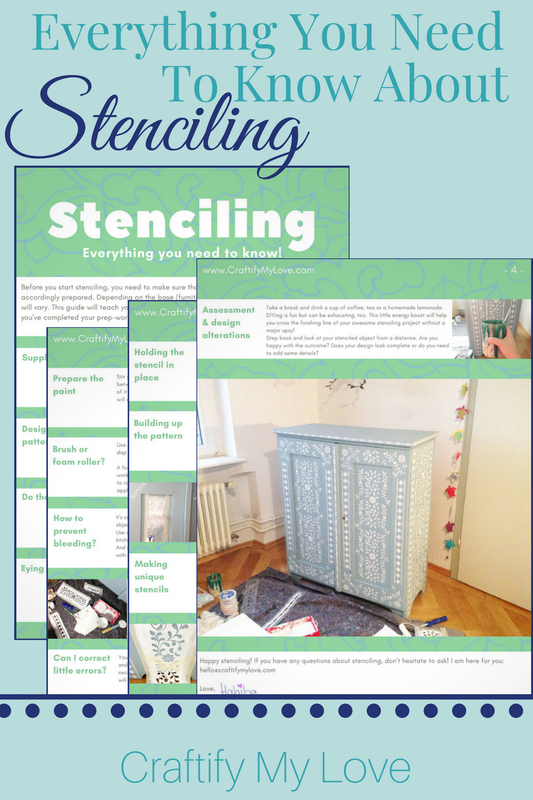 PS: Don’t forget to master the art of stenciling by downloading your FREE Know-It-All Guide, now. I haven’t stenciled in years but did stencil quite a few accents onto our walls when we moved into our house. These are great tips. Pinned. Thank you, my dear, for the support! I haven’t stencilled on my walls as we are renting and have popcorn walls everywhere. 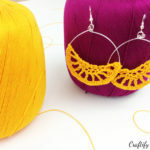 Great guide, thank you for sharing it at The Really Crafty Link Party this week. I rarely stencil, but lately I’ve been thinking about using my Sizzix to created stencils, so this may be the push I needed to give it a try. Thank you so much for your feedback. 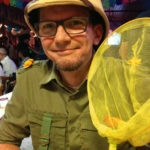 This is exactly why I blog: To inspire other people to start or re-start crafting or using a certain technique again. 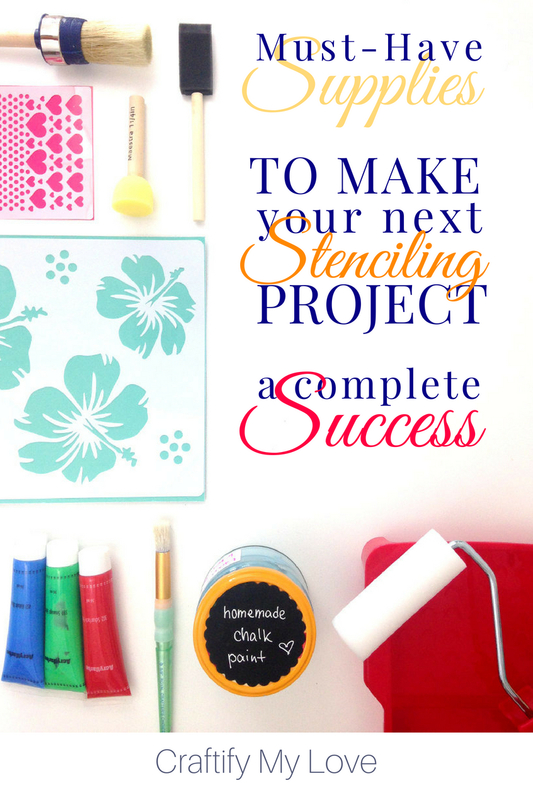 Let me know if you have any questions about stenciling. I am more than happy to help! Thank you for the tips, just started stenciling and this will help.